Generating new business opportunities means constantly attracting new leads. There are several tools that you can incorporate and combine in a long-term strategy to ensure that your company is clearly on your prospects’ radar. You need to leave the competition trailing in your wake by proving to your prospects that you offer the best solution to their problems. When you are a parts manufacturer or vendor, one of the business drivers that should not be missing from your strategy is uploading your parts catalog. 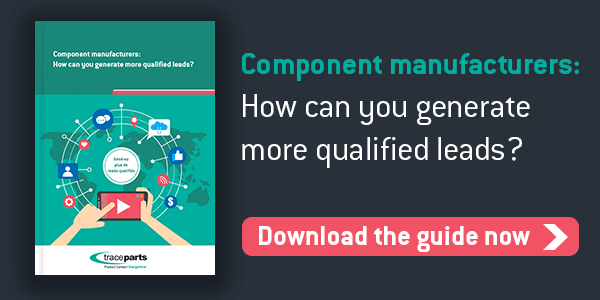 Read on to find out how you can generate leads by publishing your component catalog online. Even today, several parts manufacturers still sell their products the traditional way, so be different and stand out from the competition! Offer customers and prospects a new way of viewing your products. An online parts catalog gives prospects a clear insight into your products, while allowing them to download the parts in many of the CAD formats on the market and adding them directly to their design project. Choosing between this e-catalog and a good old paper catalog is a no-brainer, especially when you consider that 86% of people who download a part end up buying it! So feel free to invest in this strategy, sharpen your competitive edge and give your prospects an innovative way of viewing your products. Bear in mind that buyers today use a clearly different approach to a few years ago and that they prefer looking up information on their own before contacting the company when they are ready to buy. Therefore, you need to be active in the process and do everything you can to make them want to buy your products and make their life that much easier. As a parts manufacturer, your catalog is the most important tool in your possession. Use it and transform it into a leads generating machine! Demand for CAD models is rising sharply, with engineers and designers hunting for technical and detailed product information every day, including 3D models. To generate leads, you need to analyze your prospects’ requirements and behavior before using that information to fine-tune your marketing practices. Publishing your component catalog to the web will help modernize your marketing strategy while remaining focused on your prospects’ new requirements and continuing to grow your customer base. Publishing your parts catalog online must be accompanied by a long-term marketing strategy. Many manufacturers fail to fully exploit the goldmine in their possession or lack the realization that a parts catalog is actually a marketing tool in its own right that should be brought to the fore and promoted. Publishing your parts catalog online will increase your ranking in search engines, since you will have technical content with specific keywords. You will attract people that are not necessarily aware of your company and thereby increase your number of leads. You can ramp up and strengthen your visibility by using such CAD content platforms as TraceParts to publish your parts catalog. These platforms boast a large audience of engineers and designers who use them as their daily work tool, as well as provide details about how many times your products have been downloaded. When looking to generate leads, you should not restrict your strategy to a single tool. Your parts catalog must act as a springboard for spearheading other actions, such as uploading banner ads and launching email campaigns to boost your product visibility, raise your product awareness and reach out to new customers. Calling on a provider with expertise in publishing parts catalogs online and the ability to deliver digital marketing services at the same time, like TraceParts, can save you valuable time. Publishing your parts catalog online can put your company in the fast lane in terms of boosting marketing performance, increasing the number of leads and gaining a clearer insight into your prospects’ behavior with the aim of delivering the best-fit solutions for their needs. For component suppliers, design software or computer hardware vendors and 3D printing & rapid prototyping professionals.